Macular degeneration is a disease of the macula, an area of the retina at the back of the eye that is responsible for fine detail vision. Vision loss usually occurs gradually and typically affects both eyes at different rates. Even with a loss of central vision, however, color vision and peripheral vision may remain clear. 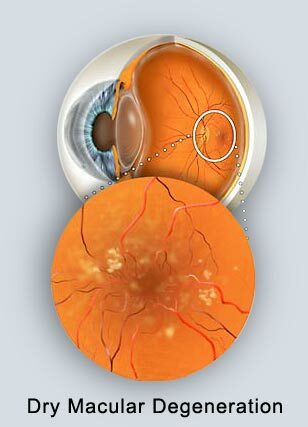 Wet macular degeneration occurs when abnormal or leaking blood vessels grow underneath the retina in the area of the macula. These changes can lead to distorted or blurred vision and, in some cases, a rapid and severe loss of straight ahead vision. The vast majority of cases of macular degeneration are the dry type, in which there is thinning or deterioration of the tissues of the macula or the formation of abnormal yellow deposits called drusen. Progression of dry macular degeneration occurs very slowly and does not always affect both eyes in the same way. Age: Macular degeneration is the leading cause of decreased vision in people over 65 years of age. Digital Angiography is the most widely used macular degeneration diagnostic test. During the test, a harmless orange-red dye called Fluorescein will be injected into a vein in the arm. The dye travels through the body to the blood vessels in the retina. A special camera takes multiple photographs. The pictures are then analyzed to identify damage to the lining of the retina or atypical new blood vessels. The formation of new blood vessels from blood vessels in and under the macula is often the first physical sign that macular degeneration may develop. Optical Coherence Tomography (OCT) uses light waves to create a contour map of the retina and can show areas of thickening or fluid accumulation. There has been active research on the use of vitamins and nutritional supplements called antioxidants to try to prevent or slow macular degeneration. Antioxidants are thought to protect against the damaging effects of oxygen-charged molecules called free radicals. A potentially important group of antioxidants are called carotenoids. These are the pigments that give fruits and vegetables their color. Two carotenoids that occur naturally in the macula are lutein and zeaxanthin. Some research studies suggest that people who have diets high in lutein and zeaxanthin may have a lower risk of developing macular degeneration. Kale, raw spinach, and collard greens are vegetables with the highest amount of lutein and zeaxanthin. You can also buy nutritional supplements (multivitamins) that are high in these and other antioxidants. In patients that experience significant progression of their macular degeneration, low vision aids may be of benefit. Low vision aids range from hand-held magnifying glasses to sophisticated systems that use video cameras to enlarge a printed page. Lifestyle aids such as large print books, tape-recorded books or magazines, large print playing cards, talking clocks and scales and many other devices are available. The doctors refer patients to specialists which work with patients to maximize their available vision (low vision specialists), when appropriate. In some cases of wet macular degeneration, laser treatment may be recommended. This involves the use of painless laser light to destroy abnormal, leaking blood vessels under the retina. This form of treatment is only possible when the abnormal blood vessels are far enough away from the macula that the laser will not produce further damage. Only rare cases of wet macular degeneration meet these criteria. When laser treatment is possible, it may slow or stop the progression of the disease. However, it is generally not expected to recover any of the vision that has already been lost. A relatively new form of treatment for some cases of wet macular degeneration is called photodynamic therapy or PDT. In those cases where PDT is appropriate, slowing of the loss of vision and sometimes, even improvement in vision are possible. 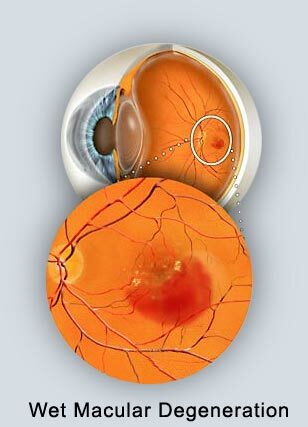 Anti-VEGF Therapies (Lucentis of Avastin) are medications that can regress the abnormal bleeding and swelling caused by wet macular degeneration. When indicated, these medications can be injected into or around the eye to help stabilize or even improve the vision of a patient with macular degeneration. To have any chance of the newer treatments for macular degeneration provide any benefit, it is important that patients contact the doctors immediately if they notice any change in their vision or Amsler Grid changes.